Honestly, this was my most anticipated film of the summer, and definitely one of my most anticipated of the entire year (probably right behind Star Wars for me). While most folks would think I’d get more excited for the eventual Bruce Springsteen biopic (which will hopefully hit theaters in the not too distant future), the story of N.W.A., one of the most influential group of musicians ever, both in rap and outside of it, is a fantastic story, and if done well, it would make for a helluva film. F. Gary Gray, who directed Ice Cube all the way back in the 90’s in Friday, directs the film, Cube, Dr. Dre, and Eazy-E’s widow, Tomica Woods-Wright, all produce the film, so chances are this is gonna be a pretty accurate depiction of what really happened when they were putting out music that helped not just the era they were living in, but music that has stood the test of time, and is even more relevant in the recent racial tension that’s been rampant recently here in the United States. Here’s my review of Straight Outta Compton. 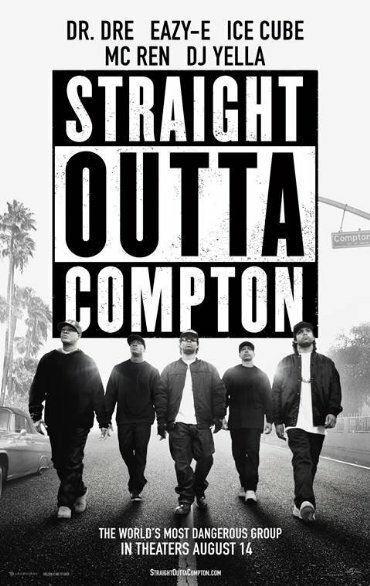 As mentioned, the film tells the rise and eventual fall of N.W.A, the highly influental group consisting of Cube (O’Shea Jackson Jr.) Eazy-E (Jason Mitchell) and Dre (Corey Hawkins) MC Ren (Aldis Hodge) and DJ Yella (Neil Brown Jr.). The film primarily follows the first three of the group, with everybody coming from the streets of South-Central Los Angeles, or Compton to be exact. E is a drug dealer, Dre is a young father whose just been kicked out of his mom’s house, and Cube is an aspiring songwriter, but nobody’s given him his shot yet. The three all find each other, and get Ren and Yella into what they have cooking, which is a rap group unlike anything that’s come before. It wasn’t hip-hop like anything anywhere, but music that talked about where they came from, and the struggles that they had as young African-American men in Los Angeles in the late 80’s, which racial tensions between the cops and guys like them trying to make a living where about as high as they could get. They end up putting out the album Straight Outta Compton, an album that is wildly popular, but scares many, with the group being dubbed “The World’s Most Dangerous Rap Group”. What’s so brilliant about Straight Outta Compton is that F. Gary Gray creates this world of Los Angeles that feels so alive and vivid, similar to what many of us saw in films like Boyz n the Hood, Friday, and other films about black culture in Los Angeles. What makes this film stand out is that it doesn’t shy away from anything in the group and the environment around these young men, as it feels gritty and scary, and whether or not you like N.W.A.’s music, after seeing this film, you will sympathize with every single one of the members, and the struggle that they had to overcome, and how songs like “F*** Tha Police” play off the way that they do in this film. You feel as angry as the group does against the police brutality, and how N.W.A. has helped changed that, in some ways for better and in some ways for worse. Many have wondered how a music biopic coming out in the summer (let alone an R-rated one) was able to make $60 million dollars at the box office this past weekend, and once you see it, its so apparent as to why it was as successful as it was. A little has to do with the fact that I mentioned earlier, which is that we’re at a point right now in our country where racial tension is at a surprising high all over, and this film is coming out almost at the perfect time for folks of all races to come together in a theater and watch this film that will hopefully help ease tensions, but who knows (probably should get back to my review before this becomes a political statement). All of the performances are great in the film, with the standouts being the young men who played Cube (Jackson is the son of the real Ice Cube), Dre and E, with the standout being Mitchell as Eazy-E, who is phenomenal in the role. The only recognizable actor in the whole film is Paul Giamatti, who plays Jerry Heller, N.W.A.’s manager who had possibly been screwing them out of some money, like most young musical acts when they start out. It’s a great performance, and one of the actor’s best work in quite some time. And I only have one complaint with the film, and its a common complaint among other critics who loved the film, is that the first half of the film is brilliant, but the second half isn’t quite as great. For that first half, I honestly thought that this was easily going to be the best film of the summer/year, but after the second half, I think I’d easily say its one of the very best of the summer/year, no doubt. Hell, I loved the film so much, I really hope that the film becomes an early Oscar contender, because there are some really terrific performances in the film from everyone, and the film itself is really great. Universal has already had a great year in terms of financial success, thanks to the mammoth that was Jurassic World earlier this summer, and thanks to the critical/financial success that is Straight Outta Compton, they continue to have the great year that they’ve been having. There’s very little out right now to see, so of course I can’t recommend you seeing Compton enough, even if the second half is a bit uneven. Even if you’re not a fan of N.W.A., I wouldn’t be surprised if you are once you see this film, and understand the meaning behind what/where these guys came from. And you’ll also want to go download their music off of iTunes, like I’m about to once I finish up this review.